DANVILLE, Va. - To celebrate 25 seasons, the Danville Braves are teaming up with Riverside Health and Rehabilitation Center to encourage fans to select their favorite all-time D-Braves players as part of a 25th anniversary team, which will be featured in a special baseball card set giveaway this season. Fan voting is now live below and the voting will end on May 23rd at 5 p.m. ET. The top two vote-getters at catcher, 1B, 2B, SS, 3B, six outfielders, six pitchers, and one manager will be selected to the 25th anniversary team. 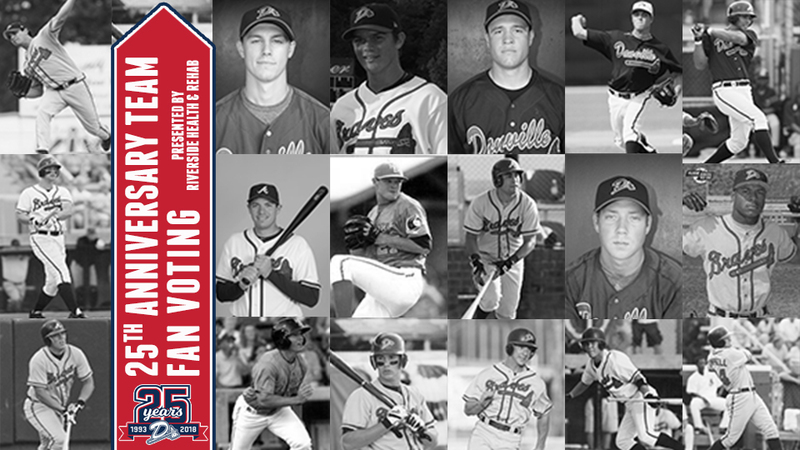 The first 500 fans at the Danville Braves' home game on Friday, June 29, against the Elizabethton Twins will receive a special 25th anniversary team card set featuring the selected players from fan voting as part of several anniversary giveaways this season. For our full 2018 promotional schedule, click here.